This case study presents an innovative way of presenting artefacts and exhibitions in general, in a museum. This way is called “True Augmented Reality (AR)”. 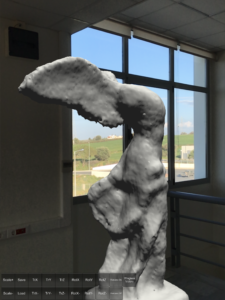 Specifically, this case study provides information about True AR and its adaptation to a real museum (the Industrial Museum and Cultural and Educational Center in Thessaloniki). True AR is a new innovation and evolution of Virtual Museums. Lately, the main technologies that are used in Virtual Museums are Virtual Reality (VR), Augmented Reality (AR) and holographic Augmented Reality. This case study allows the most important innovation of True AR, which is the fact that it is very difficult to distinguish the objects of the real world from the augmented objects, to be tested in a real museum, with real visitors in order to discover whether True AR enhances the quality of experience of a museum visitor, or not. In this work, we discuss a new and innovative way of cultural heritage preservation. This way is called “True Augmented Reality (AR)”. True AR is defined as a modification of the user’s perception of their surroundings that cannot be detected by the user. This innovation could be adapted by the Virtual Museums of the future, in order to enhance the museum visitors’ quality of experience. This will result to many more people visiting museums in a more frequent time periods, which will contribute a lot to the preservation of cultural heritage. For instance, the fact that a visitor will not be able to tell, at a first glance, if the artefact that he/she is looking at is real or not, is an example of True AR adaptation in a museum and it is expected to draw the visitors’ interest. Also, True AR could not be limited to artefacts only, but could be extended even to buildings or life-sized statues. This would be a great opportunity for the museum visitors to see buildings and statues in the best possible quality, something that will allow them to feel like they are really in next to them. Augmented and Virtual Reality nowadays are used widely in the cultural heritage domain in order to present monuments (reconstructed or not) to the users, but still in many cases the users can tell immediately that the things that they are looking at are not real. True AR aims at the opposite. Its purpose is to provide its results in the best quality possible so that the users will not be able to tell the real objects from the augmented ones, or to delay that for as long as possible. There is a great history behind the Industrial Museum and Cultural and Educational Center in Thessaloniki. It was an almost unknown monument of the city of Thessaloniki, the complex of Islahane, an Orphanage and a School of Arts and Crafts founded during the last ottoman period of the city. It was located in the east side of the city walls, inside and outside, in the region of Evangelistria. Little was known about it until recently when the Ephorate of Contemporary and Modern Monuments of Central Macedonia has identified the only existing building out of a group of three that used to house the institution. The institution started out as an orphanage earlier at the middle of 18th century and at the last quarter of 19th century evolved to be a technical school providing the expertise of diverse techniques to male orphans, mostly Muslims. The article presents the function and evolution of the school, investigation the available sources up to now. The departure of Muslims of the city meant the end of the Islahane and the buildings were attributed to other uses, one became a Greek High School and another, an accommodation for Greek refugees from Asia Minor. The one still existing building was transformed into a private factory that continued the same techniques that were taught into the technical school, blacksmithing, metallurgy and woodworking . Today this building is being restored and it is meant to become a Cultural Multiplex offering to the future visitors a narration of its history and transformations through time. The Industrial Museum and Cultural and Educational Center in Thessaloniki is essentially a museum of its own premises, since it exhibits industrial machines and artifacts found within or are related to it and presents the memories acquired there. It was built in 1875 as a technical school for orphans and later it was turned into an industry and a foundry until the 1990’s. Works turning it into a museum began in 2011 and ended in 2015. The official opening took place in November 2017. Its objective is the presentation of the history of the technical schools that operated in similar institutions / orphanages, the techniques of the workshops and industries in the second half of the 19th century in Greece and the history of casting, one of the oldest techniques and the operation of foundries. The exhibition section was created using the widest possible range of cutting-edge methods of shaping, presenting and formulating the interpretive material, using modern exhibitionism principles, both in content and formulation. As a result, the multi-site (www.ppxi.gr) is not a classic museum with the exhibits in displays but its purpose is to provide information and performances a) about the technical education at the beginning of the 20th century and b) about the ways of operating and organizing and the techniques of the foundry-machine shops and generally the crafts of the same era. As required by the museological study, it is necessary to present the above in an experiential way, in order to understand the way of education, the working conditions of that era, the way of the operation of the production line in general and especially of the machines, tools and facilities. Figure 2. A small statue representing the Wingless Victory of Samothrace. Figure 3. The reconstructed model of the statue of the Wingless Victory of Samothrace, which could be used for True AR experiments. True AR is defined to be a modification of the user’s perception of their surroundings that cannot be detected by the user. The most obvious parameter of the test protocol should be which senses can be used: even the most sophisticated visual display will immediately fail a test in which users can use their hands to touch objects in order to tell the real from the virtual . True AR is the next step in Augmented Reality. It is the future of Augmented Reality, merging successfully the real with the virtual world. It is a very promising concept that it is expected to draw the interest of the people and to become a very popular trend for the future mixed reality applications very quickly. Figure 4. 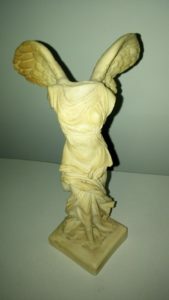 The 3D model of the Wingless Victory of Samothrace in life-sized version. Figure 5. 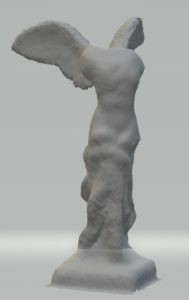 The 3D model of the Wingless Victory of Samothrace, having almost the same size as the scanned model (Figure 2), placed on a table. Nowadays, many museums use (or started using recently) Virtual Reality and Augmented Reality technologies in order to present their exhibitions to the public. Other museums exist solely in Virtual Reality. In any case, these museums are called Virtual Museums, the museums of the future. Such museums have managed to draw the interest and attention of many people, something that is a very important step towards the preservation of the cultural heritage, as more and more people visit those museums, in order to admire these technologies and as a result they learn many things about the museum exhibitions in a fun and interesting way. If Virtual and Augmented Reality have managed to draw more people to the museums, then True AR is expected to have the same results in even greater scale. That is because, with the help of True AR, the museum exhibitions can be presented in the best possible quality. 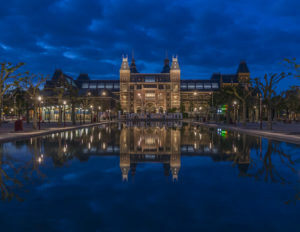 The exhibits, from the smallest vase to the largest building or statue can be presented in such a good quality and analysis, that the museum visitor will not be able to tell if this exhibit is part of the real world or not, at a first glance. Also, this technology will be very helpful for people that cannot travel to other countries for various reasons, because they will be able to use a True AR application and view the exhibit they want in very good detail and even interact with it. True AR thus provides us with the means for the best possible presentation of the above issues giving the visitor of the museum the feeling of “presence”, meaning that the visitor will feel like the exhibit that he/she is looking at is in the same room with him/her. In this case study, we presented a possible application of the True Augmented Reality technology to a museum and specifically to the Industrial Museum and Cultural and Educational Center in Thessaloniki. 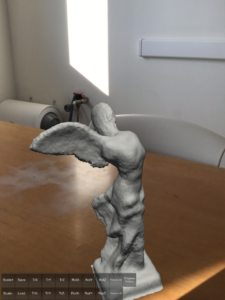 The main concept of True AR was presented and the first steps of an experiment with the Wingless Statue of Samothrace were shown. Finally, the benefits of that application were discussed, with the most important of them being the ability of visiting whichever monument we want or finding and looking up closely whichever exhibit we want, in the future, without being able to tell if the object or the monument we are looking at is real or not, at a first glance. True AR combined with the Storytelling, Presence and Gamification fields  is expected to create the perfect experience for the visitors of Virtual Museums. Christoforidou S., Kondylidou A., Mesochoriti E., Syrgianni A., Valavanidou A.: The Islahane of Thessaloniki, a contemporary monument, a witness to technical education as a means of vocational training of orphan children. Cultural Institute of Former School of Arts and Professions Hamidie (Islahame). ppxi.gr, Last accessed on 25th March 2018.